Applies to Internal DAC only (Wired Headset/AUX in Poweramp output settings). Please post your device (with optional ROM/Android version) if Poweramp alpha Hi-Res audio works for it. I would start with the following tested devices. These are devices which were tested by me, usually, it can also work for variants (e.g. Sony Z5 line, not just Premium, etc.). Looks like it works well on LG G2 D802, 6.0.1 crDroid ROM. OnePlus One, official CM13 nightlies, AUX allows 44.1/48/96/192, works excellent! I'd like to add that OnePlus One's Marshmallow CyanogenMod-based builds also support it, I've personally used it with ResurectionRemix ROMs up to 192 and I've read from others that "stock" CM13 nightlies also support it just fine. On the other hand, I've read that SultanXDA's CAF-based builds for some reason didn't support it at least up 'till now, not sure whether that has changed or will change. Hello, I'm no music expert, and I just joined the beta program, so I'm still trying to figure things out, but from what it looks like, I am able to use the high res output on my htc m9 running Android 6.0(I do believe the htc m8 should be able to also, maybe m7, but not so sure). However, dvc does not work. 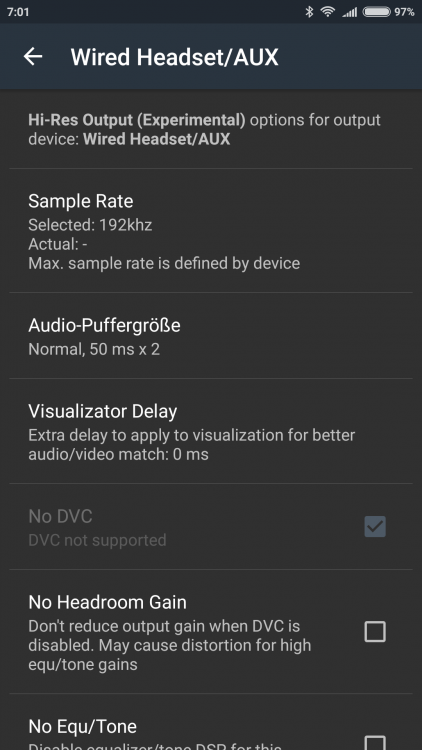 So in short htc m9 is a yes, but no dvc support. Update, a minute after posting, the music stopped playing, however, the visualizer showed that there was something playing. The lows were moving even though I couldn't hear any sound. After switching to normal, and back to high res, the music is now playing again. Will test the reliability on my device and post back. 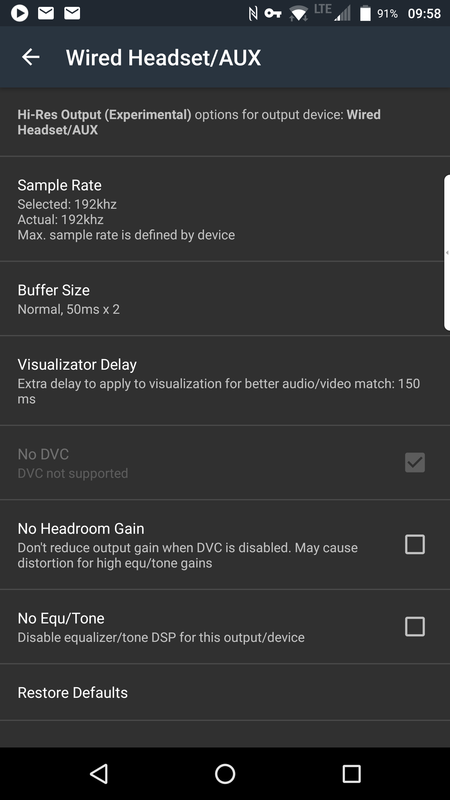 Update, yeah, the stability of high res audio output on the htc m9 isn't that great. The audio tends to cut out. Again, I'm not a soundengineer, or some guy who knows a ton about the details of music, such as resampler, so I can't say I know if it's a setting I changed that did this, or its a stability issue, or just me. Probably me. Also, can someone clarify what this does feature does? Does it allow users to listen to high res audio with high res audio gear? Does it make low quality mp3s sound like high res audio like the sony xperia music players can? What's the function of this feature along with the other new ones. Thanks. Hey guys, me again, can I ask a favor? Could you please go to the settings for high res and change a setting? For me, If I change the sample rate, or check of no eq, I get a failed, changed to default output. Does this happen to anyone else? Thanks. OnePlus One - Official COS 13.0. Works! Works great on my BlackBerry PRIV running Android 6.0.1. I had to set the visualization delay to 150ms to get the vis to match the audio. I left all of the other settings at their defaults. Played with quite a bit of hacks in mixer_paths and audio_policy on the Sony Z3 Tablet Compact (pretty much hardware to Z3), and finally got Hi-res to work. Now the device plays 24bit/44.1khz flacs without going to 48khz system sample rate. DVC is mandatory, and disabling DVC forces Poweramp to fall back to OpenSL ES. Unfortunately, Z3 will resample to 48khz anyway. There is only one DAC clock, so it works on multiples of 48khz, always. (Then delta-sigma DACs will oversample to very high frequency and quantize all those 24/16bits to 1bit). Android audio system, though, can work on 44.1 or 48khz, so no resampling will happen in Android in this case (but it will still resample on lower levels to DAC 48khz). 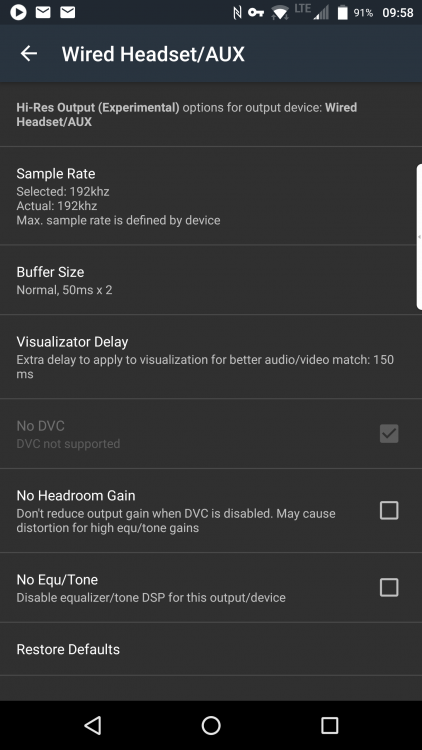 It's debatable if Qualcomm DSP resampling is better/worse vs Android resampler. Since I also have alsa with a good quality resampler (not as elaborate as sox, but better than Sony stock implementation) running in the background to handle non Poweramp audio, if Poweramp hi-res does bypass this layer, I can leave its setting at 48k without fear of going from 44.1 to 96 to 48.